HUNTINGTON, Jedediah (1743-1818), was an American general in the Continental Army during the American Revolutionary War. After the war, he served in numerous civilian posts. 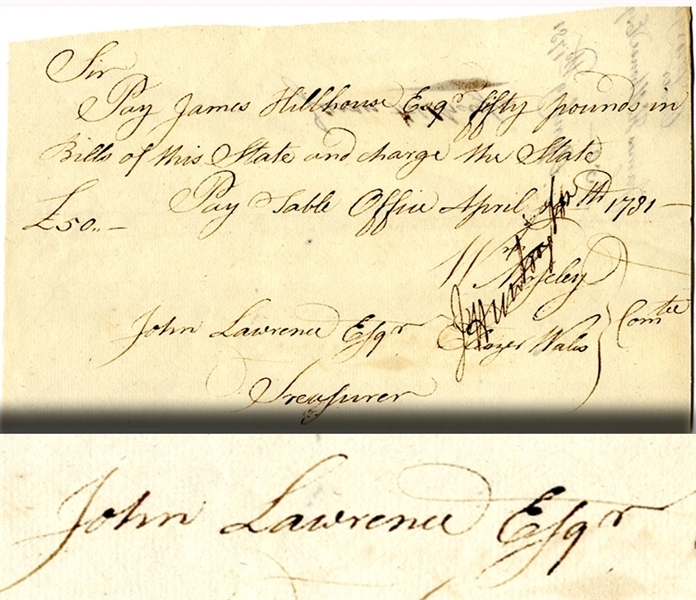 War-date Document Signed by Jedediah Huntington, W. Mosley and Eliazer Wales, ordering pay for James Hillhouse from Treasurer John Lawrence, April 11, 1781. Signed on verso by Hillhouse. Fine condition. James Hillhouse (1754-1832) was an American lawyer, real estate developer, and politician from New Haven, Connecticut. He represented the state in both chambers of the US Congress. During the Revolutionary War, Hillhouse served as captain of the Second Company of the Governor's Foot Guard. During the successful British invasion of New Haven on July 5, 1779, he commanded troops alongside Aaron Burr, with Yale student volunteers.